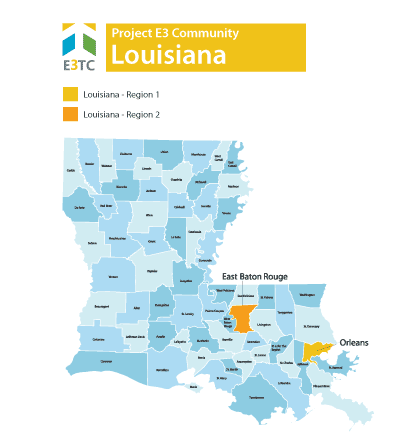 Louisiana is a location chosen as a targeted community through the Vocational Rehabilitation Technical Assistance Center: Targeted Communities (VR-TAC-TC) or Project E3. Project E3 will partner with State VR Agencies and local community partners to improve outreach and employment-related services to underserved people with disabilities in this community. Louisiana is known for its rich diversity of people. It has more Native American tribes than any other southern state and is home to the descendants of a variety of settlers, including the French, Spanish, English, German, Acadians, West Indians, Africans, Irish and Italians, and now almost every nationality on earth. There has never been an official language in Louisiana. 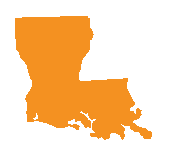 It is the only state in the U.S. with political subdivisions termed parishes, which are the local government’s equivalent to counties. Energy, advanced manufacturing, commercial fishing, chemicals, and agriculture are all vital parts of the state’s economy. HIV and Mental Health Training: Provide training, technical assistance, and capacity building for vocational rehabilitation and related professionals. Systems Approach to Placement: Evaluate the effect of training using a Systems Approach to Placement. This model identifies the job placement process in vocational rehabilitation as a system with a dynamic network of interconnecting elements. Counselor Motivational Interviewing Training:Provide opportunities for vocational rehabilitation counselors to access training on Motivational Interviewing. This evidence-based counseling method is used to help people resolve ambivalence and develop internal motivation to change behavior. Vocational Rehabilitation Client Outreach, Recruitment, and Retention: Louisiana Rehabilitation Services will inform the targeted communities of the positive outcomes of vocational rehabilitation, employment, and independent living via the internet, a project website, and communities of practice. Follow-Up Case Management Services: Provide follow-up case management services to vocational rehabilitation participants. Services could includes transportation to appointments and follow-up via telephone calls, texting, and e-mails. Project E3 will provide Lousiana’s state Vocational Rehabilitation agencies and their partners with the skills and competencies needed to effectively and efficiently address barriers to competitive integrated employment and community integration encountered by persons with disabilities in these regions. We will leverage promising practices, knowledge, and experience gained from this project to expand employment opportunities for individuals with disabilities from underserved and economically disadvantaged populations throughout Louisiana and across the United States. Outreach to at least 190 individuals in the targeted populations and communities. Increase community awareness of HIV/AIDS and/or Mental Health conditions, their effects on daily lives of clients and families, and ways to access available resources. Provide training and technical assistance to at least 25 vocational rehabilitation counselors, employment specialists, community outreach personnel, and selected employees of related government entities. Prepare and approve at least 38 Individual Plans for Employment for clients accepted for vocational rehabilitation services. Achieve competitive integrated employment for at least 43% of participants with HIV/AIDS and at least 40% of participants with mental health conditions.